Learn to Spin on February 22nd! 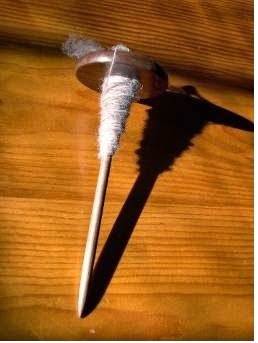 Handspinning with a spindle is an ancient craft that is still important even today. Everyone in a household, including children as young as four, used to help spin yarn that clothed the family and kept them warm! 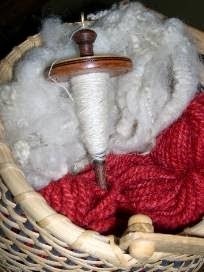 Join Joanne and learn a bit about wool and learn to use a handspindle to make your own yarn. When you leave this class, you’ll own a spindle, some extra wool, and you’ll be able to practice spinning at home. Note: This class is all you’ll need to begin spinning. It’s also a great introduction to the skills you’ll need if you decide to learn to spin on a spinning wheel. Spaces are Limited! Register via Paypal (click that button) to reserve your spot! Visit cloverleaffibre.com for registration information, email cloverleaf.fibre@gmail.com or comment on this blog post if you have questions. Learn to spin in a friendly, hands-on environment! Joanne Seiff is a co-organizer of the Manitoba Fibre Festival and the author of Fiber Gathering, a book about fiber festivals, and Knit Green: 20 Projects and Ideas for Sustainability. She’s been spinning for over 30 years-- and knitting longer than that! Her writing has appeared in Spin-Off Magazine. Her handspun yarn and fiber art has been sold in galleries and won awards at state fairs and in art competitions. She teaches throughout North America at sheep shows, fiber festivals, and yarn shops. 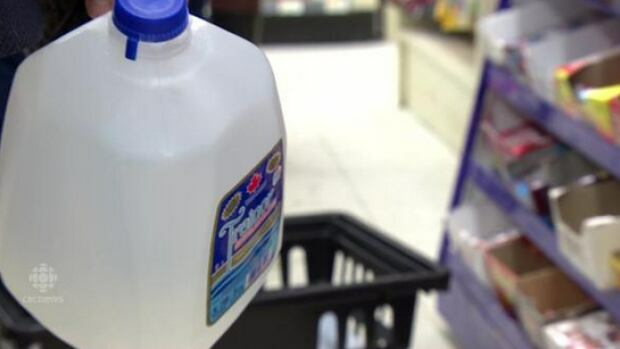 Winnipeg is under a boil water advisory. I wrote Boil-water advisory shows how Winnipeggers are fortunate this morning...and it's already online at the CBC. Wow! Fast--like how fast we had to start boiling water last night. Let's hope kids in Winnipeg will be back to blowing swimming pool bubbles in their bathwater soon--and that kids everywhere else get access to clean water, too. Meanwhile, my essay, Building Jewish Identity -- for preschoolers, came out. Suddenly, I had people I did not know (at preschool pick up, of course! where else do I go?) telling me that they were reading my work. This was a surprise. To be honest...a lot of the time, I write something, and I never hear a thing afterwards! Sometimes there are negative comments, but this was totally different. It was positive. The most interesting thing about all this is that I haven't been especially worried or afraid. Back when we lived in Kentucky, if I wrote a piece with anything political, controversial, or religious in it...I often heard about it. I received hate mail, or weird phone calls. It was really disconcerting and scary sometimes. It did not stop me from writing or wanting to make positive change, but it did make me wonder if it was safe, if it was worth it, and whether I should keep writing. Who knows, maybe I am just too busy to worry here, but luckily, lately, the positive feedback has outweighed anything else. Recently, I've felt like it is worth it to keep doing this writing thing. At the same time, I've been working on a new knitting design. This has been fortunate, because when somebody wakes me up every 2-3 hours, I find it much harder to formulate any kind of argument or point...hence the delay in posting here...but knit? heck yeah. I can still knit. One of my goals is to try to make a positive difference in the world, and of course, that can feel daunting. For many years, I taught...religious school, adult ed., high school, community college, even grad. school seminars. Recently, while I've been corralling twins, I haven't had much of an opportunity for teaching, although I occasionally manage to offer a fiber arts class. When I did teach, I felt that helping students, one person at a time, was really meaningful. I struggle sometimes to find that same meaning when I am exclusively writing and designing...sometimes the topics aren't life-changing--but occasionally, things work out. It's been great to get a chance every now and then to comment on something that I hope might affect change. I sometimes write on religious issues. At times, much of my work is in the knitwear design/hand spinning world. Yet, it has been really exciting lately to have these pieces on the CBC online. Many times, I don't get much response from what I've written, but at least it is a soapbox to describe what I hear from other parents of young children, new moms, etc. I love that part of what I do. I'm reposting the links here so that if you're interested, you can be part of the conversation.